Speaking personally, though likely for many readers, one of the nice things about living in the modern age is that many of the homes and estates of the wealthy and privileged have been opened to folk from the lower orders, meaning we can now freely clod-hop through their elegant drawing rooms and gawp at their heirlooms and art works. In Japan, of course, clod-hopping becomes sock-hopping, because of having to remove outer footwear before entering any home — let alone one boasting the polished zelkova or cherrywood flooring of heritage villas and grand residencies. The lobbies of these homes are typically spacious, with a stone floor laid beneath a wooden deck, where footwear is dealt with. 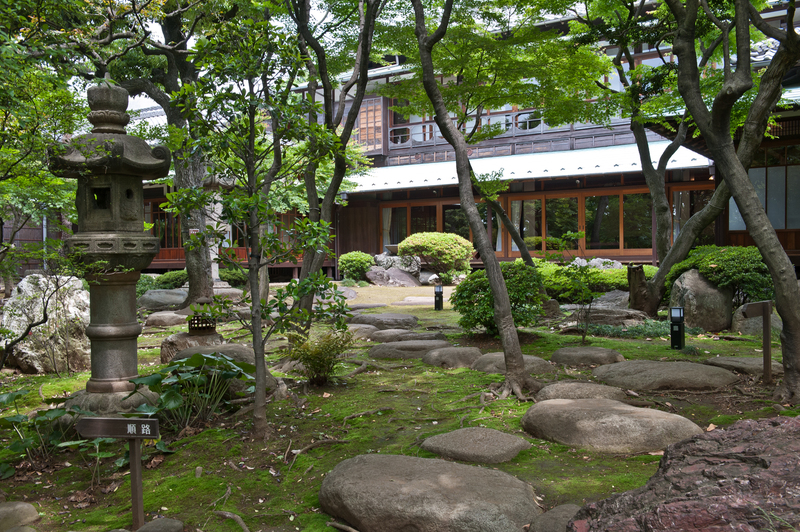 In cases when owners commissioned the construction of particularly impressive gardens, the convention was to step onto a kutsu-nugu-ishi (shoe-removing stone) before gaining a purchase on even the lobby flooring of the residence proper. These days, you are more likely to see these large, semi-flat rocks at the rear of the house. This is the case at the Kyu Asakura Residence in Tokyo’s Daikanyama district, a fashionable quarter of the central Shibuya Ward. The home and garden, commissioned in 1919 by Torajiro Asakura, a chairman of the then Metropolitan Assembly, are just a five-minute walk from the station. Yet if ancient gardens were the dwellings of the gods, those from the period spanning the Meiji and Taisho eras (1868-1926) were conspicuously grandiose adjuncts to the residences of the powerful and affluent. 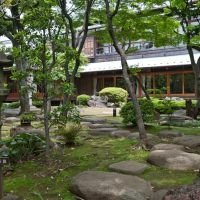 Hence, the shoe-removing stone past which those entering the main garden at the Kyu Asakura Residence must go is more like a transplanted slab of shoreline than a rock. Such hints of hubris were characteristic of landscapes of those eras, designs that were commissioned by rising industrialists, politicians and the new order of aristocracy created by the awarding of titles such as baron and marquis to a chosen few. Indeed, imposing and ostentatious stones such as Kyu Asakura’s can be seen elsewhere in gardens of a similar age. In the case of the Maeda Residence’s garden in the capital’s Komaba district of Meguro Ward, a crane and a truck were used to carry the shoe-removing stone from the family’s Hongo home across the city in Bunkyo Ward to the sumptuous villa they had built in 1929. Again, looking at this period in garden design for the wealthy, a similarly massive stone is prominent at the Iwasaki Mansion built in 1896 just a few minutes’ walk from city-center Ueno Station in Tokyo. Designed by British architect Josiah Conder for the founding family of the Mitsubishi conglomerate, this residence also displayed a taste for oversize garden features, notably its tall chozubachi (water-laver basins) that were a symbol of affluence in that period. There are other similar examples of these at the Rakujuen Garden in Mishima, Shizuoka Prefecture, and down the road from there at the Kiunkaku Villa in coastal Atami. The stone lanterns of the Kyu Asakura Garden demonstrate a similar fascination, or identification, with the gargantuan. 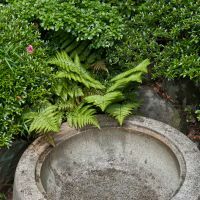 The dominant style here is the nigatsudo (pedestal) type, a very solidly designed object that brings to mind a huge stone lantern at the Kyu Furukawa Residence in the Komagome district of Toshima Ward. In both cases, though these ornaments may tend to look like miniature lighthouses, their very scale serves to ground the central building itself. Yet moderating any unseemly whiffs of pride is the landscaping itself, with much of Kyu Asakura’s rear garden built on a bluff above a dell, bringing to mind the Gotoh Museum’s garden in the Kaminoge district of Setagaya Ward. Natural forms like this are godsends for garden designers, who might otherwise have to haul in tons of earth to create interesting landforms. In the Kyu Asakura Garden, winding and undulating paths run beneath a thick canopy of trees, screening off any potentially intrusive elements. 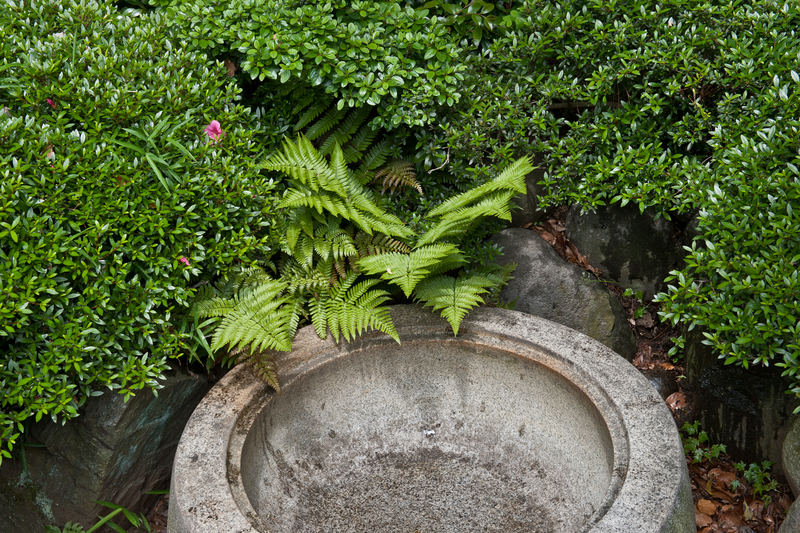 Water basins, large rocks, smaller rounded stones and roof tiles embedded beside paths add rustic touches that evoke some of the aesthetics of the tea garden. The route amid the greenery and along the path of the tea garden was meant to be transformative, a cleansing process. In this spirit, the Kyu Asakura Garden certainly provides a counterworld to the one experienced beyond its walls — even in this relatively quiet corner of the city. 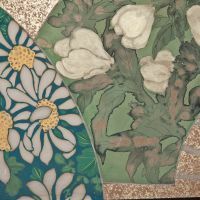 One feature of gardens in the Meiji and Taisho eras, manifest also in the early Showa Era (1926-89), was a fascination with Western-style naturalism expressed in the use of lawns, large amounts of vegetation and fully matured trees. The pathways meandering through the Kyu Asakura Garden are set at different levels in the wooded dell, creating a sense of spatial depth. Meanwhile, space here flows in much the same way as light: fluidly, following its own contours and circulations. Akin to walking along the roji pathways in tea gardens, the density of foliage, and well-placed stones, promotes a sensation of detachment from the urban domain. This in turn engenders a mood of refined introspection. If the stillness of this garden owes much to its location, the sounds it produces also enhance its tranquility. Chinese gardens were the first, perhaps, to incorporate certain audio effects that would deepen the poetry of the experience. Hence plants were enlisted for their acoustic properties, with broad-leaved varieties placed where rain or wind on them could be heard. The serenity of nature could be further replicated by planting Chinese parasol trees beneath a window, or a plantain grove in a corner of a wall where its rustling in the breeze could be heard. Pines were similarly installed for the sound of air passing through the branches, an effect compared to the soughing of wind in a remote mountain valley, while giant bamboo was used for its creaking in the moving air. Similar audio effects, along with insect sounds in certain seasons, can be heard in the Kyu Asakura Garden. In his “Song of Meditation,” the Zen monk and poet Hakuin Ekaku (1686-1768) wrote of the joys of “unobstructed repose.” For urban dwellers, the temporary sanctuary of the Kyu Asakura Garden provides just the right counterbalance to the negative forces generated by cities. 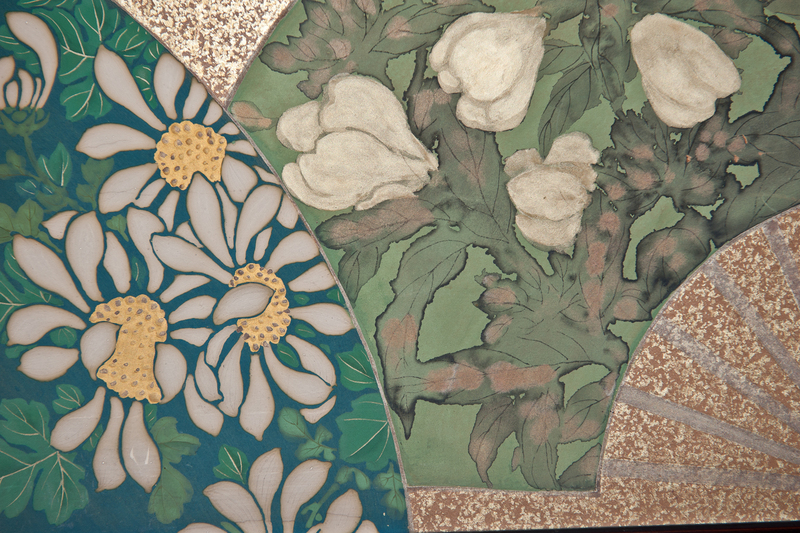 A lucky few, however, may find that the state of suspended thrall created by such gardens, the contact with nature and its plenitude, turn out to be less escapism than connection. Getting there: The garden is a 5-minute walk from Daikanyama Station on the Tokyu Toyoko Line or Daikanyama Eki bus stop on the Yuyake Koyake Route of the Hachiko Bus. Admission to the house and garden is ¥100. Open 10 a.m.-6 p.m.; closed Monday. Stephen Mansfield’s latest garden book, “Japan’s Master Gardens: Lessons in Space and Environment” (Tuttle), was published in April 2012.